Note: Yes, we know, the Vacheron ‘222’ was not designed by Gerald Genta but by Hysek. We stand corrected. Since the early days of my watch addiction (I admit), I am a sucker for the designs of Gerald Genta in the 1970s. Most of the time, I neglect the Vacheron and drool on pictures of ‘his’ Patek Philippe Nautilus, Audemars Piguet Royal Oak and IWC Ingenieur SL. I always found it hard to get proper information and pictures of the Vacheron Constantin ‘222’, nowadays known as the Vacheron Constantin Overseas. The ‘222’ was the last icon that Gerald Genta designed in the 1970s, just one year after the Patek Philippe Nautilus 3700 and IWC Ingenieur SL 1832. However, yesterday I stumbled across the The Hour Lounge website, a Vacheron Constantin (where did the ‘et’ go?) discussion forum. In this picture you see the ‘Jumbo’ versions of the Ingenieur SL, Royal Oak, Nautilus and ‘222’. 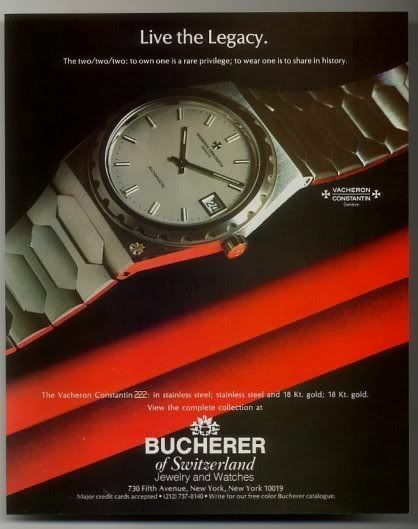 The in 1977 introduced ‘222’ was limited to 500 pieces in stainless steel, 100 in gold and 120 in gold/steel combination. These watches were delivered in a nice leather box and included a money clip in the shape of the watch case. The movement in the ‘222’ is the VC 1120, based on the Jeager LeCoultre caliber 920 movement (but never used it in their own watches). 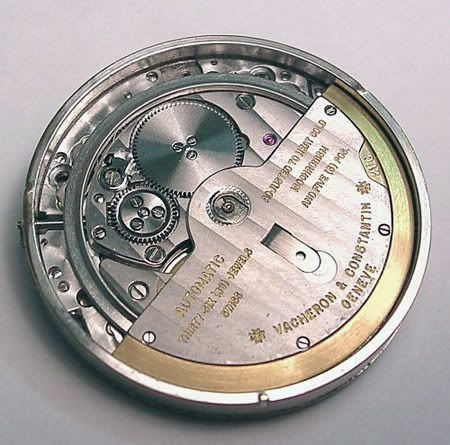 The Royal Oak and the Nautilus also used iteration of this movement. Anyway, to cut a long story short, I finally found a great article on the internet about the Vacheron Constantin ‘222’, written by Leonardo of the The Hour Lounge forum. You can find the article by clicking this link. Someone should make a PDF of this article, just for safe keeping! There is a gold version of the ‘222’ currently up for sale at chrono24.com, from Italy in great condition (dates 1980) and will cost you 13.800 Euros. I don’t think the stainless steel version will go for very much less, in similar condition.